InterContinental Dalian is located between Youhao and Zhongshan Square, within walking distance to the subway station, train station, Russian Street, Dalian local restaurants and Food Street. It offers free WiFi in public areas, a fitness centre and 3 dining options. Well-equipped with meeting and banquet facilities, the hotel is one of the preferred meeting and convention places in Dalian. InterContinental Dalian Hotel is about 27 minutes by car and 35 minutes by metro from Dalian ZhouShuiZi International Airport, and only a 9-minute drive from Dalian Railway Station. With contemporary and elegant styles, all guestrooms are spacious and come with iPod docking stations, flat-screen cable TV and BOSE entertainment sound system. They have a bathtub, a safe, coffee/tea maker and a minibar. Guest can work out at the full-equipped fitness centre, or enjoy a good swim at the hotel indoor pool. Hotel InterContinental Dalian also provides massages and spa treatments. 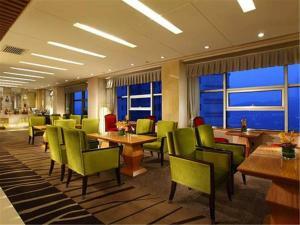 The executive floor overlooks the city and the harbour. The hotel offers “in the know” authentic experience to visit the scenic Dalian seaside and fishing village where you can enjoy fresh air and local seafood delicacies. Guests can find Western and Asian dishes at Cafe@6, and enjoy a Cantonese dishes and light snacks at the Chinese restaurant. When would you like to stay at InterContinental Dalian ? The room has a LCD TV and a minibar. A work desk and a chair are provided.Please write the preferred bedding configuration at the time of booking. Please note that the bedding configuration is not guaranteed and will be confirmed upon arrival, subject to availability. Room offers 2 single beds or a king-size bed upon request. It offers a flat-screen TV, sound system and high-speed WiFi access. You will also find comfortable bed mattress and fine bedding linens. A pillow menu is available.Please write the preferred bedding configuration at the time of booking. Please note that the bedding configuration is not guaranteed and will be confirmed upon arrival, subject to availability. The suite comes with a living room and a bedroom.Please write the preferred bedding configuration at the time of booking. Please note that the bedding configuration is not guaranteed and will be confirmed upon arrival, subject to availability. Features with free access to club lounge with free breakfast and evening cocktails.Please write the preferred bedding configuration at the time of booking. Please note that the bedding configuration is not guaranteed and will be confirmed upon arrival, subject to availability. Overlooking the city, the king room comes with a LCD TV and minibar. Please note that for guests who reserved Breakfast Included rate, the breakfast included is only for 2 staying adults. Children who are under 1.2 metres will not be charged for breakfast, children who are between 1.2 metres to 1.5 metres will be charged 50% of the fee. Children who are above 1.5 metres will be charged the full price. Each day we'll check prices and send you an email for your selected dates at InterContinental Dalian. If you don't have specific dates but would like to check prices for say next weekend or say next month we can check the price too. Click to write a review and share your experience of InterContinental Dalian with other travellers.